With an epic climb of it's own, a 50 mile, 4,200 feet elevation, "Half Century" is available for those who prefer the sanity of a challenging but shorter route. 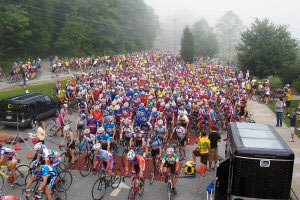 Both rides are fully supported with aid stations and SAG support. 2017 © Blood Sweat & Gears. All Rights Reserved.